If things are starting to get a little overgrown, then its time for some personal grooming. Chest, back, pits, whatever....your wife will have a renewed interest, and you'll look younger and fitter. Consultation and trim will take place at your convenience. 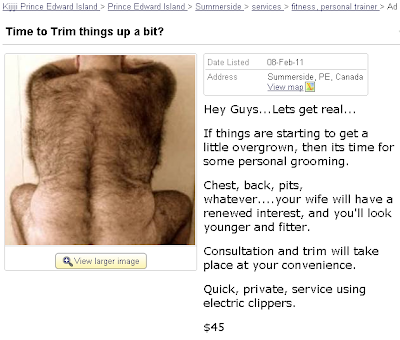 Quick, private, service using electric clippers. LOL! looks like somebody found sasquatch.